This department displays our entire Pond Filtration range. Please use our sorting tool to locate the most suitable pond filter for your project. 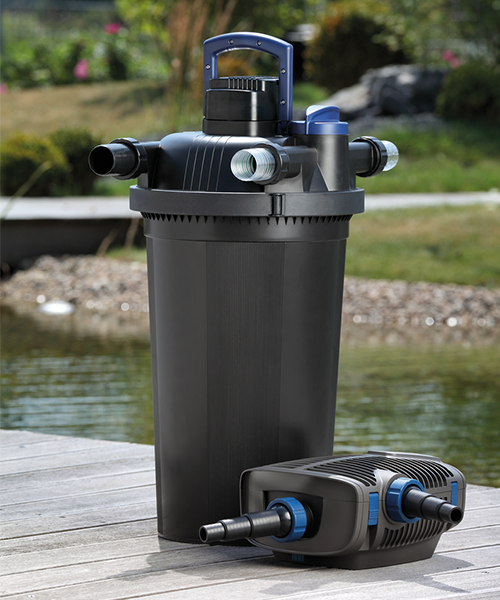 Water Garden Ltd specialise in OASE Pond Filters as these are the very best systems on the market. However, the complete range is still considerable so it can be difficult to select the most suitable system for your pond or water feature. This department includes all of our pond filters and complete filter systems and the sorting tools allow you to drill down based on the most important considerations. For example, your pond volume, whether the pond has no fish, fish or Koi Carp and the type of style of filter are the key factors. 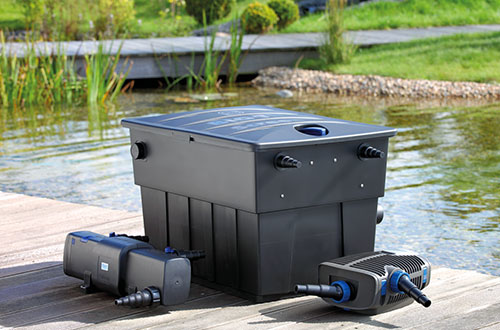 Virtually all OASE Pond Filters stipulate their maximum suitability based on no fish, within the product name (for example; a FiltoClear 6000 filter will cope with a pond of up to 6000 Litres without fish). Firstly, we suggest calculating your pond volume. The calculation for this is Length (metres) x W (metres) x D (metres) x 1000. So, if you have a pond which measures L3m x W2m x D1m x 1000 = 6000 Litres water volume. The next decision is whether you intend the pond or feature to be purely ornamental (i.e. without fish) or whether you intend to stock small fish (i.e. Goldfish, Rudd, Shubunkins) or if you are planning to cater for Koi Carp. As a general rule, goldfish will place twice the biological load on a pond filter than having no fish, so the pond filter needs to be twice as capable. Koi Carp are voracious eaters and can grow quickly and to a significant size and these will place four times the load than without fish. So, a 6000L Koi Pond would need a filter capable of processing a 24000 Litres pond without fish. Once you have filled in the ‘Max Volume’ box and selected ‘No fish’, Fish’ or ‘Koi’ tick box, you can then adjust the ‘Price’ box to refine your search for a filter to match your budget. If in any doubt, give our team of friendly experts at Water Garden Ltd a call and we will help you select the most effective filter system for you.